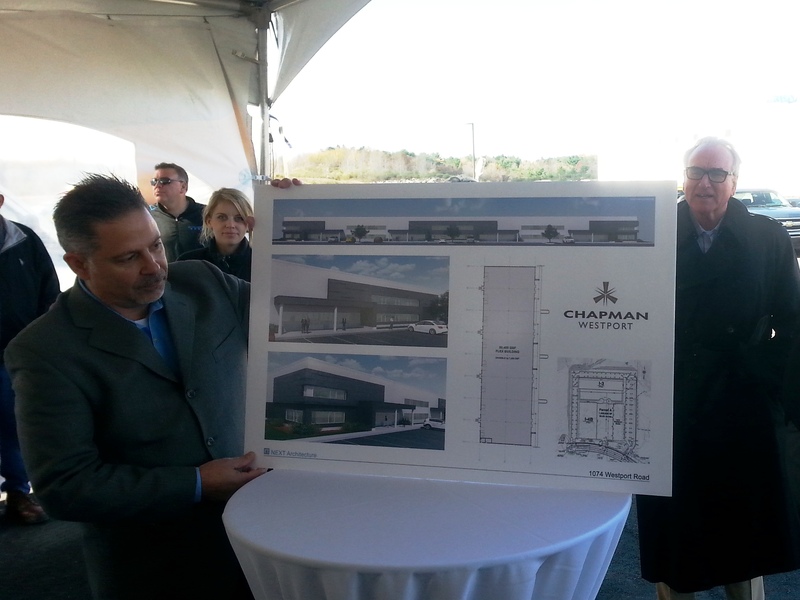 I spent the lunch hour eating bratwurst and listening to Chapman Properties present the next spec industrial building at Chapman Westport to the brokerage community. The building is 1074 Westport Road and will be a 50,400 sq. ft. flex industrial building that can be demised down to 7,500 sq. ft. spaces. Developer Steve Thomas (right) listens as Dan Delisio from NEXT Architecture talks about the 1074 Westport building to be built at Chapman Westport. The building will be built directly behind the new GE Plastics advance materials research facility, which is nearing completion for a year-end occupancy. Across Westport Road on the north side of Route 576, two pads were being readied in Findlay Industrial Park for construction. Ashley Capital is planning a 316,000 sq. ft. building and Buncher recently acquired 12 acres to build an 80,000 sq. Ft. spec warehouse. The projects bring the total spec Class A industrial product in the pipeline to more than 1 million sq. ft. That’s great news for a market with almost no new industrial product for the last two years.